Long shrouded in mystery and misunderstanding, the Fraternal Order of Free and Accepted Masons has been the subject of countless books and sermons denouncing the organization. Because of this scrutiny throughout the centuries, and the fact that it now counts over 5 million members worldwide, it is less a secret society and more a society with many secrets. Although members keep specifics of the rites and rituals within the lodge itself, some basic tenets of Freemasonry are well known. The society originated with the guilds of medieval stonemasons and became an honorary society in the 17th and 18th centuries using rites of ancient religious orders and brotherhoods. The first Grand Lodge was founded in England in 1717 and soon spread to other countries in the British Empire. Masonry became active in the United States during the Revolutionary War, with the membership roles containing names such as Paul Revere and George Washington. Even today, many past Presidents and members of Congress have been Masons. Although every member must profess a belief in a Supreme Being, or “Great Architect of the Universe”, Freemasonry is not a religious organization. Belief in a supreme being is all that is asked for, and the specific interpretation of that being is left up to the individual member. Because of the perceived anticlerical attitudes of Freemasons in which they denied the unquestioning acceptance of clerical authority, they are often seen as anti-religious by many churches. There is no central head in the organization; rather each Craft Lodge is exclusive unto itself. Because of the local nature of each lodge, the customs and rites of each locality may vary, but all Masons are bound to conform to the moral laws of society and to abide by the laws of the government where they live. The unifying factors are the elaborate and symbolic rites and ceremonies that utilize the instruments of the stonemasons on which the original Grand Lodge was founded. There are three degrees of Masons with the first being the Entered Apprentice, the second being the Fellow Craft and the third being the Master Mason. Once a member has achieved the degree of Master Mason, they can choose to continue their study of the lessons by joining the Scottish Rite or York Rite organizations. Shriners must be Master Masons, and their organization is considered to be similar, but less solemn than the Craft Lodge. 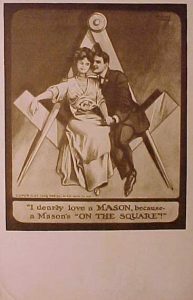 Because of the secrecy surrounding the rites and vows as well as the political influence of the Freemason organization, it has long been a target for anti-Masonic organizations. Despite the opposition, or perhaps because of it, Freemasonry is the largest “secret society” in the world today.